Below is a selection of websites, e-commerce sites and micro-sites developed by us. Microsites generally are created for the purpose of promoting a single product or a specific line of products. Often they are detached from the main site, sometimes even reside on their own domain, which simplifies the administration and enables for easy tracking of the success of a particular campaign. 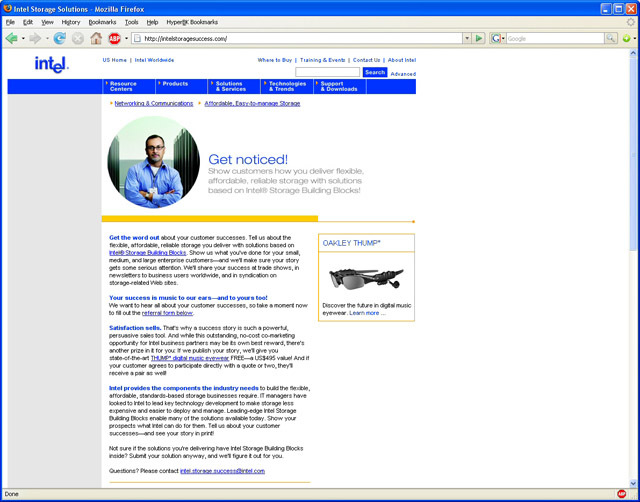 Click on the image to see an enlarged screenshot. 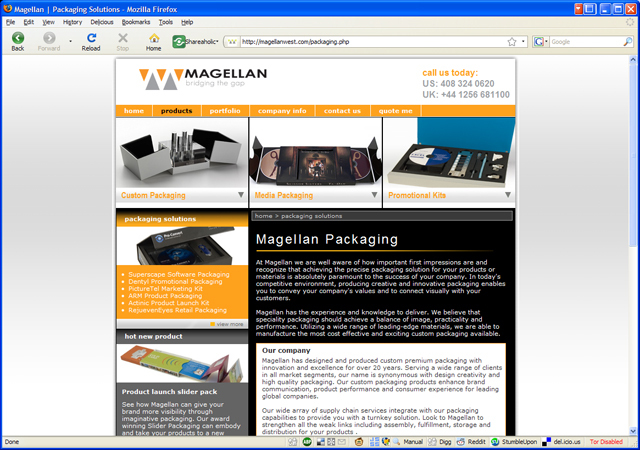 Magellan World Ltd Packaging Divison Corporate Site. 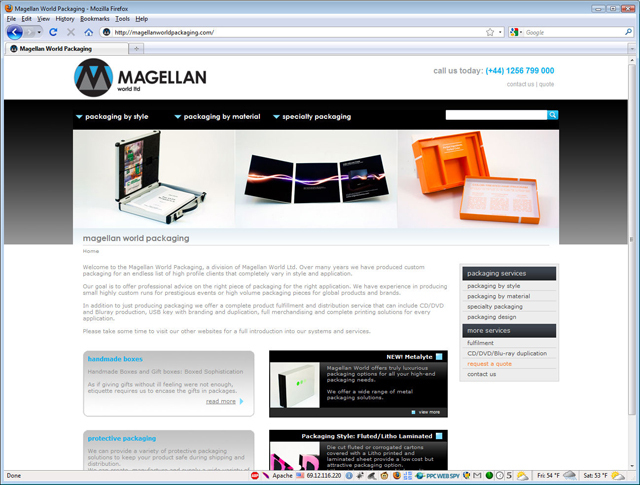 Welcome to the Magellan World Packaging, a division of Magellan World Ltd. Over many years we have produced custom packaging for an endless list of high profile clients that completely vary in style and application. Our goal is to offer professional advice on the right piece of packaging for the right application. We have experience in producing small highly custom runs for prestigious events or high volume packaging pieces for global products and brands. Strong focus on usability, SEO and SEM. 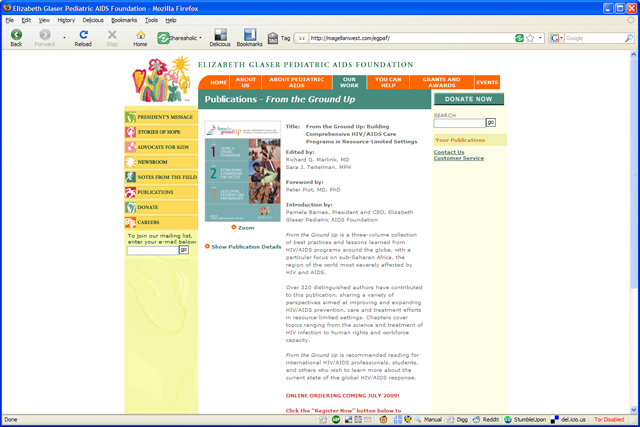 Elizabeth Glaser Pediatric AIDS Foundation. From the Ground Up is a three-volume collection of best practices and lessons learned from HIV/AIDS programs around the globe, with a particular focus on sub-Saharan Africa, the region of the world most severely affected by HIV and AIDS. Custom e-commerce implementation with FedEx integration. 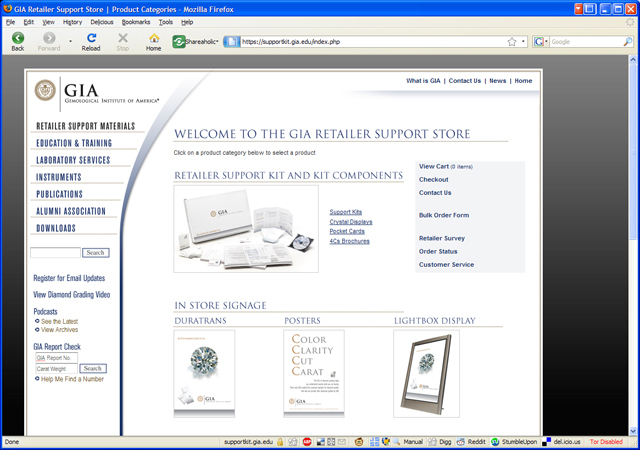 GIA Retailer Support Kit and accompanying support materials help you educate your customers about the 4Cs and the importance of a GIA grading report. Fully custom e-commerce solution for jewellers, diamond traders and others affiliated with the industry. 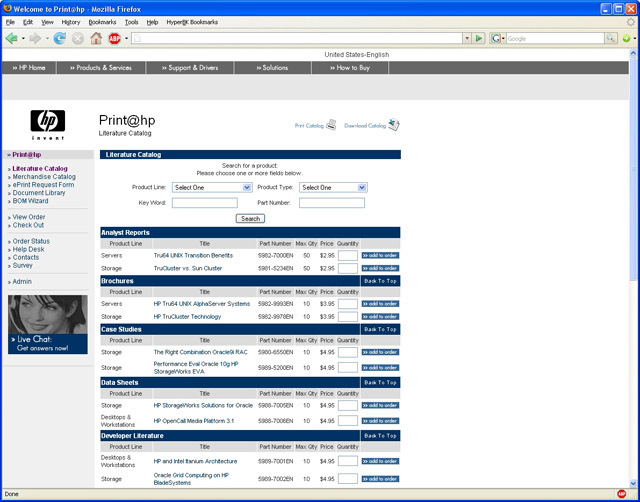 Allows for creation and ordering of fully customizable products (Logo and Company Information). 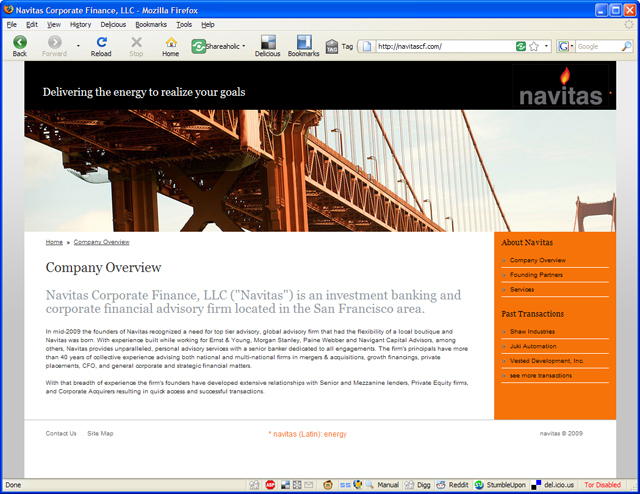 Navitas Corporate Finance LLC Corporate Site. Navitas Corporate Finance, LLC ("Navitas") is an investment banking and corporate financial advisory firm located in the San Francisco area. 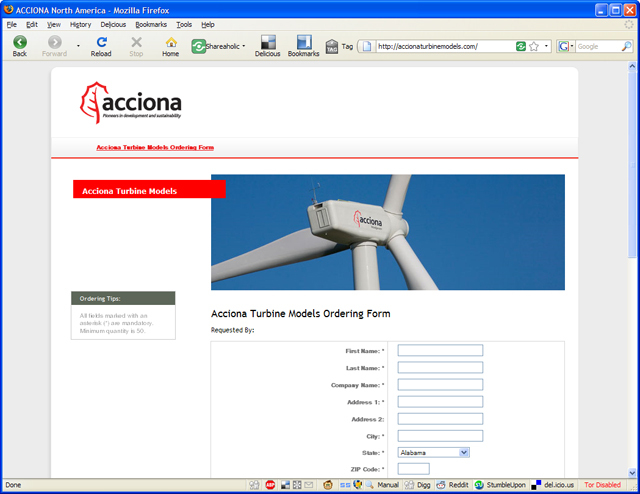 Acciona Turbine Models Ordering Form. ACCIONA is a global leader in sustainable development and social responsibility. 1-click ordering of custom imprinted turbine models for corporate events. Magellan West LLC Corporate Portal. Complete Redesign of the existing coporate site, creating a portal for the different divisons. Major focus on SEO and SEM. 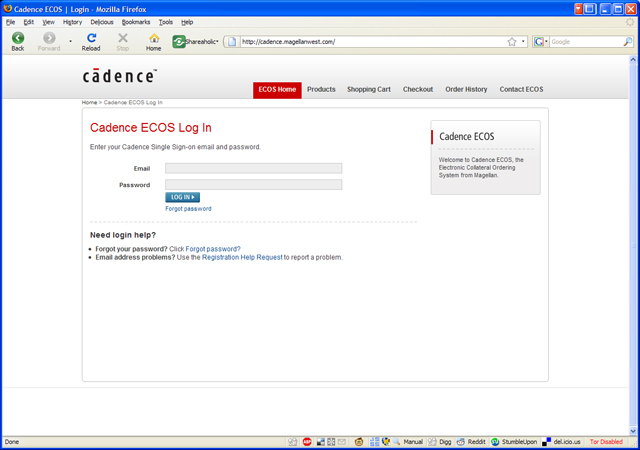 Cadence ECOS Collateral Ordering Sytem. Provide an interface to all company employees to enable hassle-free (3 click) ordering of corporate collateral. Includes custom business card design, corporate office selection, automated order approval and billing. 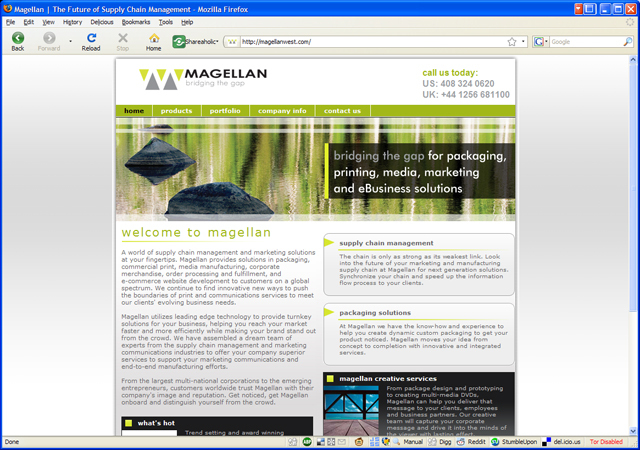 Magellan West LLC Corporate Website - Packaging. At Magellan we are well aware of how important first impressions are and recognize that achieving the precise packaging solution for your products or materials is absolutely paramount to the success of your company. Embed the packaging division in the new corporate portal, complete redesign, new content, product images. 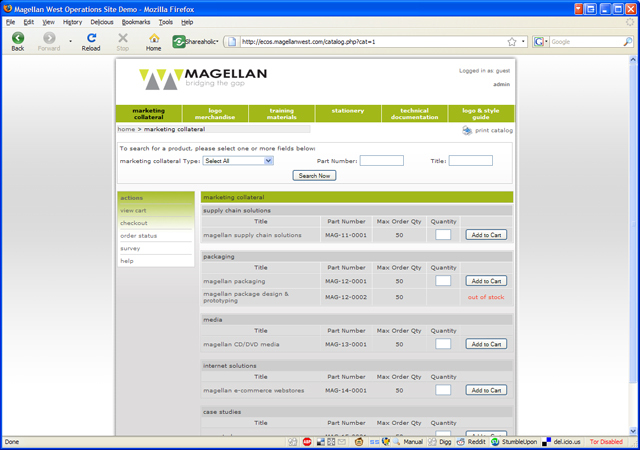 Welcome to the Magellan Electronic Commerce Ordering System (ECOS). Whether you're a new user placing your first order or someone familiar with the Magellan's ECOS, we want to make sure that your ordering experience with the Magellan's ECOS is as smooth as possible. 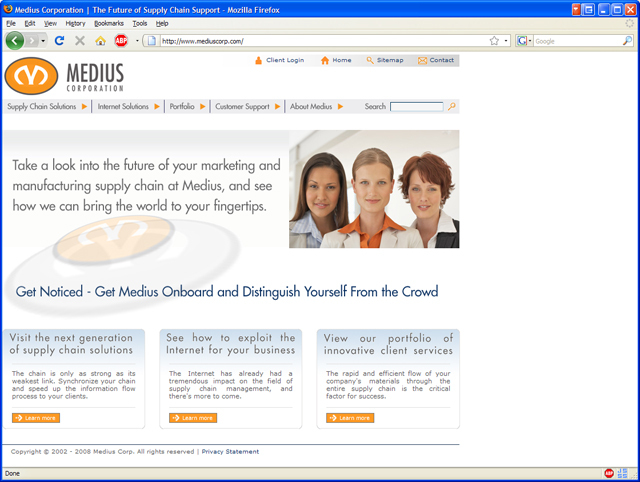 Create a working demo of the new Magellan ECOS as a marketing demo for prospects. FAST ESPTM The world's most intelligent, secure, high performance search platform. FAST ESP is the world's leading, most advanced search platform, delivering secure, relevant answers and insight to accelerate decisions, improve corporate performance, and increase profits. 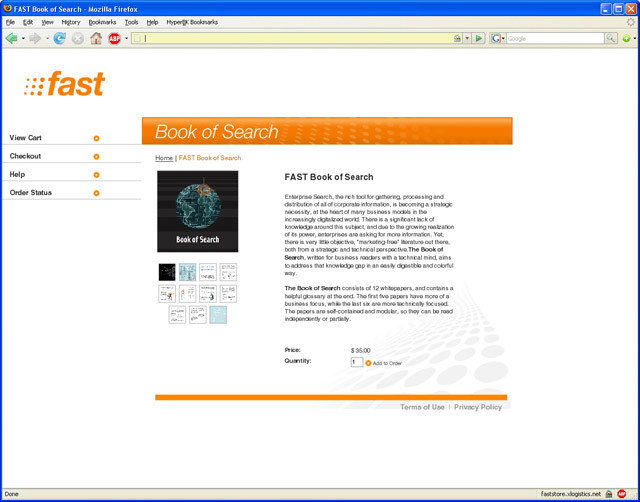 Create stand-alone microsite within the FAST site for the purpose of promoting and ordering the FAST Book Of Search. Develop pop-up with leaf-through preview option, so users can look inside the book (similar to amazon.com's "look inside" function). Fully functional e-commerce site. Ready to roll? Simply refer an Intel® PRO Gigabit Ethernet Server Adapter customer who completes a customer success story and you'll be rocking in the world's first digital music eyewear. The landing page will offer the opportunity for a giveaway for successful participation in the program. Project will consist of one HTML landing page integrated with a database for data capturing and reporting and a secondary HTML page containing contest rules/terms and conditions. Ready to morph? Use your HP ProLiant expertise to get the world's first digital music eyewear. 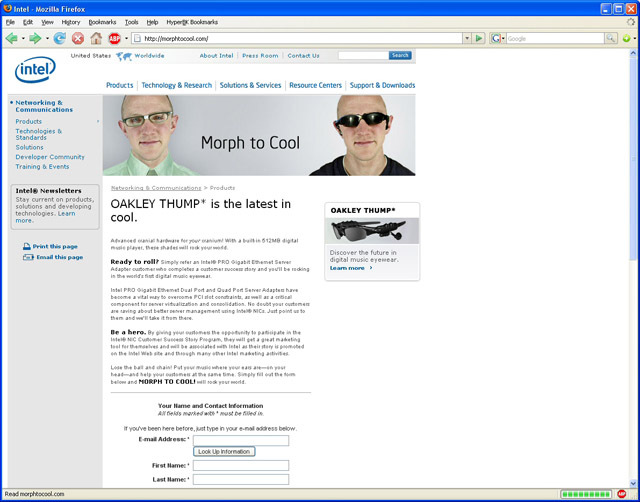 Refer any ProLiant customer who uses HP NC340T, NC360T or NC7170 Gigabit Server Adapters, and who completes a customer success story-and we'll send you a $349 pair of OAKLEY THUMP® sunglasses with high-performance optics and state-of-the-art digital audio. Get the word out about your customer successes. Tell us about the flexible, affordable, reliable storage you deliver with solutions based on Intel® Storage Building Blocks. Show us what you've done for your small, medium, and large enterprise customers and we'll make sure your story gets some serious attention. We'll share your success at trade shows, in newsletters to business users worldwide, and in syndication on storage-related Web sites. The landing page will offer the opportunity for a giveaway for successful participation in the program. Within the content on the email, an image of the giveaway will be displayed. Project will consist of one HTML landing page integrated with a database for data capturing and reporting and a secondary HTML page containing contest rules/terms and conditions. This secondary page will be accessed via a link on the landing page. Since its inception over 20 years ago, Medius has evolved to become a well known provider of supply chain management and contract manufacturing services serving major companies globally. Founded in 1984 by Daisy and George Zaia, Medius' humble beginnings are not unlike the success stories of many Silicon Valley companies. Medius today stands as an experienced leader in printing and the use of CD-ROM and DVD as information distribution tools for business, along with leading-edge technologies to bring our customers' products to market quickly and efficiently. 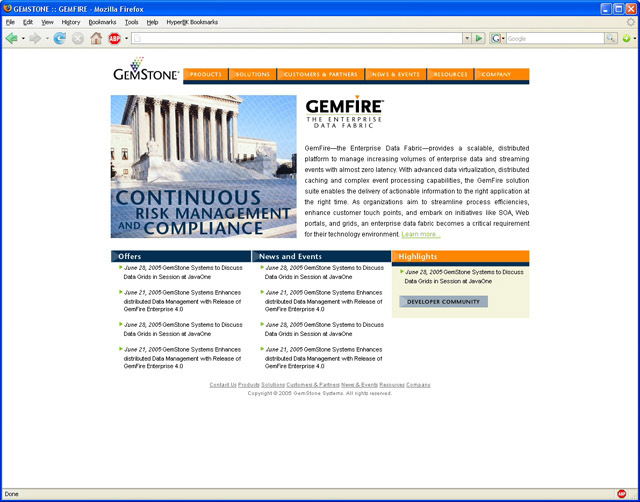 Complete redesign and relaunch of corporate website. Include client area, file upload section, online quote generator, online project submission tool. Focus on organic SEO by researching and integrating keywords relevant to industry and content. Harvest Communications is the industry's premier full service provider of printing, direct mail, fulfillment, warehouse/distribution, creative services and Internet technology solutions. 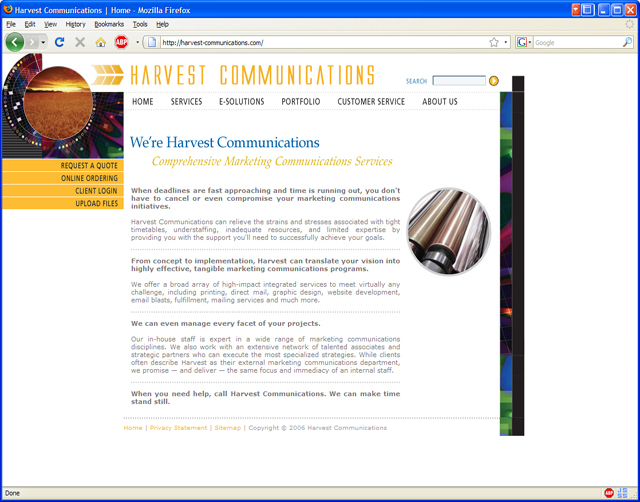 Founded in 1987, Harvest Communications, an affiliate of UnigraphicsUSA, provides solutions on a global basis to the financial, healthcare, retail and high-tech industries. 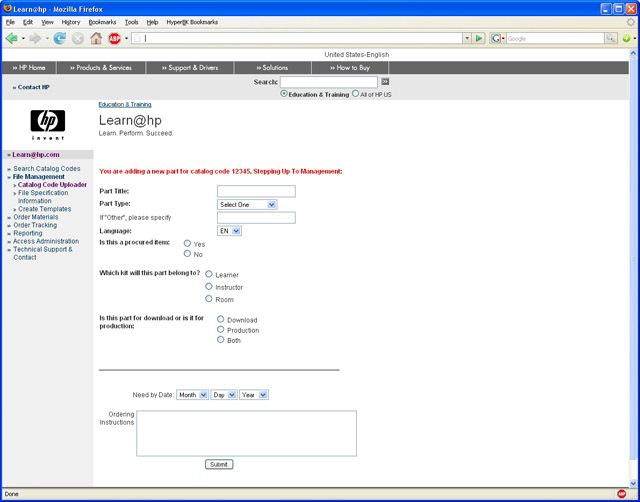 HP Learning & Development Training Materials Management and Delivery System. Hewlett-Packard organizes classes and events worldwide as part of its workforce development program. Hewlett-Packard organizes classes and events worldwide as part of its workforce development program. The project will begin with a Pilot program, consisting of five catalog codes. If the pilot program is implemented to the satisfaction of both parties, it can be expanded to involve more catalog codes. The centerpiece of the solution will be the PSP Web site. The site will be broken down into two main sections: the file uploading section and the ordering section. HP *Workforce Development* Training Materials ordering and download site. 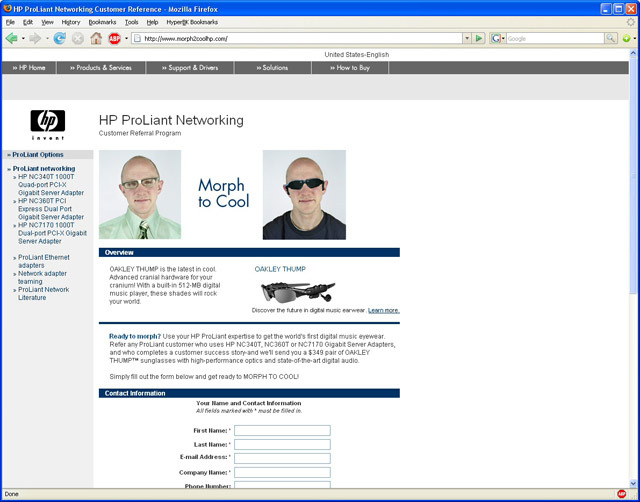 The look and feel of the site will follow HP's corporate site design guidelines. 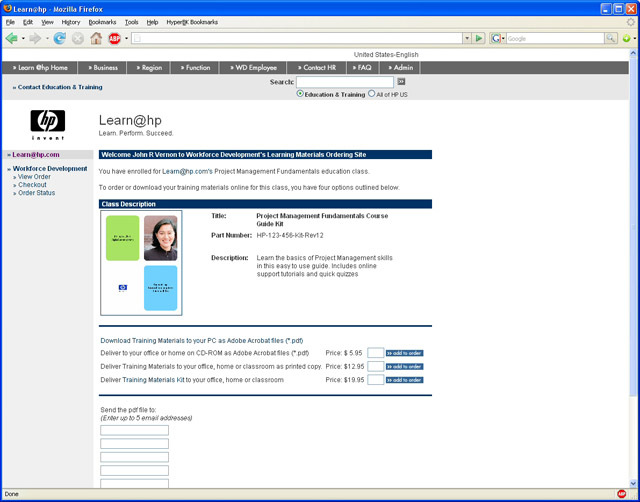 There will be two views to the site, the Learner view (student view) and the Instructor view. This system is designed to increase the speed and automate delivery of your order and provide you with greater flexibility and control. Redesign, Optimization and Feature Enhancement of existing Collateral Ordering System. Fully functional e-commerce backend. GemFire - the Enterprise Data Fabric - provides a scalable, distributed platform to manage increasing volumes of enterprise data and streaming events with almost zero latency.